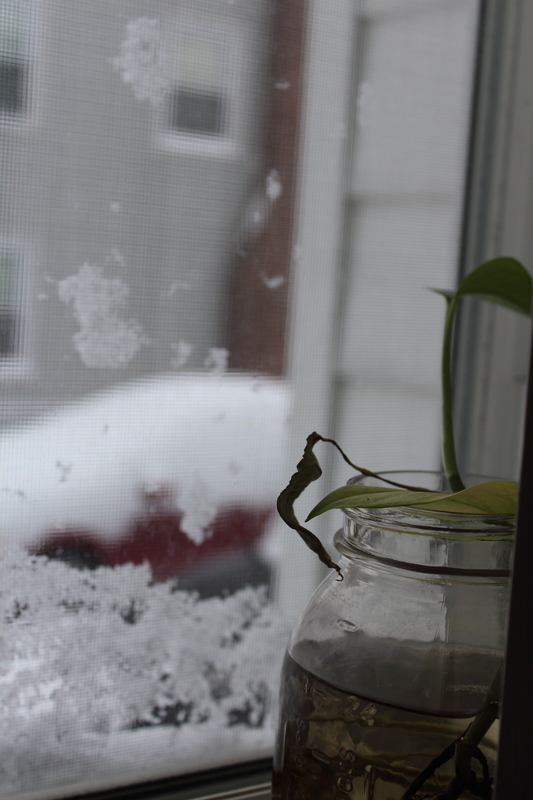 This whole winter thing has kinda got me down, it’s got my poor little plants feeling dumpy too. I suppose you could sit back and say you’ve only had about four snow storms and I would unfortunately have to agree with you. But I wouldn’t like anything about that statement. But I would probably counter with : Nemo, about 3′ of snow overnight. That should count as more than one. And again, yesterday – I woke up to snow. By 6:30 I was on the road, creeping ever closer to work. An hour later, I got a few miles closer to work had to stop at our shop and look for a shovel to extract my truck. By 9am, I had found my way to a Home Depot with a semi-plowed parking lot, bought one of their TWO shovels ($30, thanks for the rip off!) and finally SLOWLY got back to my truck and began shoveling. After I had cleared most of the snow, I got the call that we had a … you guessed it, snow day. Mmmhmm. After I had shoveled for quite some time. I finally got home, shoveled my way into the driveway and house, which took over an hour to drive there, and an hour, fourty-five mins to clear away the snow. I have decided that I’m completely over it. I’m done. I need some sunshine and at the very least, LESS snow. Once I curled up into my heating pad, typed up a million things for work, and worked up my appetite watching some food being made on tv. I decided that the end of the week should be dedicated to cleaning out the fridge and the cabinets. I had this left over bisquick from when I made chicken & dumplings, and since I’d only ever used it once for that meal, I decided I should try to use it up so it wouldn’t be taking up so much real estate in the cabinets. I had just made myself a massive mug of Earl Grey tea, and since I didn’t want to have to add cleaning my cast iron skillet to my ever growing list of things to do, I decided to make pancakes in the shape of muffins. I had already lifted enough heavy snow all morning, so I decided that lifting that skillet was the last thing that I wanted to do. I realized that my shopping list wasn’t really up-to-date, because I failed to add maple syrup to the list, and we had since run out. I thought I should just sweeten them up while mixing them so that I could be happy with just a bit of butter on them. I’m not crazy about chocolate chips in my pancakes. I’m more of a purest when it comes to pancakes, but I’m willing to branch out and toss a few things in to try and see how they work out. This time it was more out of necessity that I added the chips, since I didn’t have much else to sweeten, or top them with after they were cooked. Filling the liners only half-way seemed to be a solid choice. I wasn’t sure how much these would raise, so just to be safe, I moved the top shelf in the oven down a notch, which really wasn’t necessary, but it did make it a little easier to get a toothpick in there to test for doneness in the end. What I learned from all of this is that when you forget to buy maple syrup, and add chocolate chips to these bad boys, they all sink to the very bottom. If you are as impatient as I was the other day, then you will try to eat these before they are fully cooled. When they are a little warm, the liner doesn’t come off all that well and the chips come off with it. 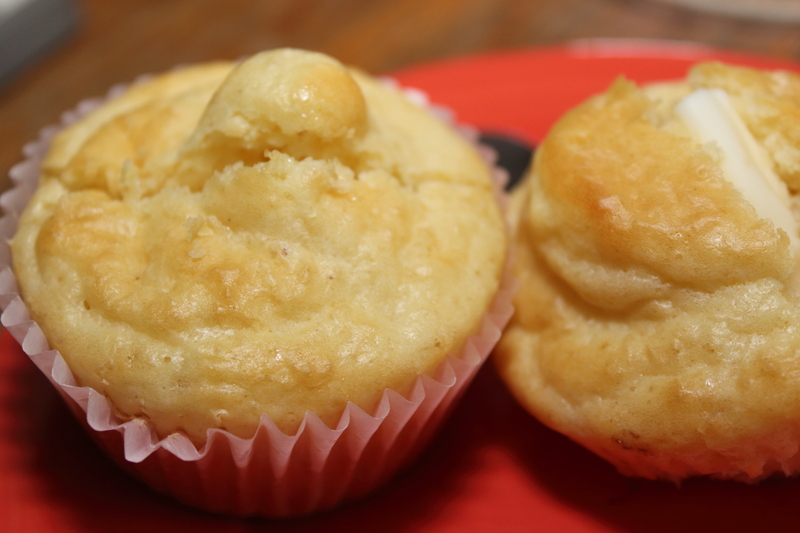 If you chill them and then toast them to warm them up you are able to keep the chips inside the muffin/pancakes. 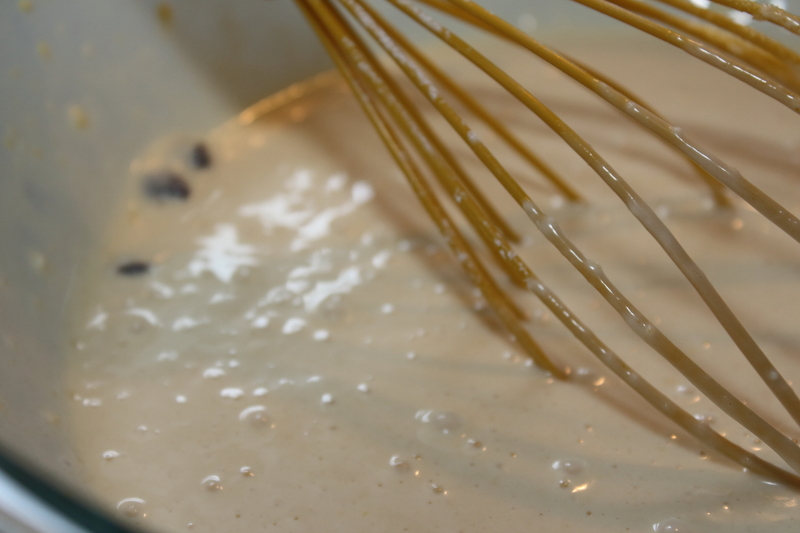 Mix until there are as few as possible lumps in the mixture. 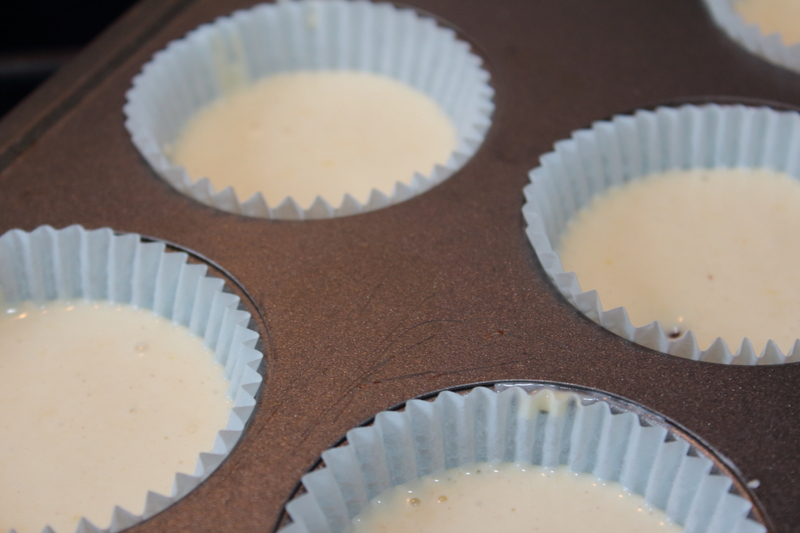 Line your muffin tins with papers, spoon in the batter until they are about 1/2 way full. Bake for 18-20 minutes, depending on your oven – I checked mine around 10 minutes and turned the trays around on the rack so that they would brown as evenly as possible. At 18 minutes I stuck a toothpick in them and they were fully cooked. Put them on a cooling rack until cooled thoroughly. I stored mine in an airtight container in the fridge overnight, and this morning, I peeled them out of the liners and cut them down the middle, toasted them until they warmed fully and put a little bit of butter on them and enjoyed them with my cup of coffee. Wow did you have an adventure, you guys have been clobbered with snow. 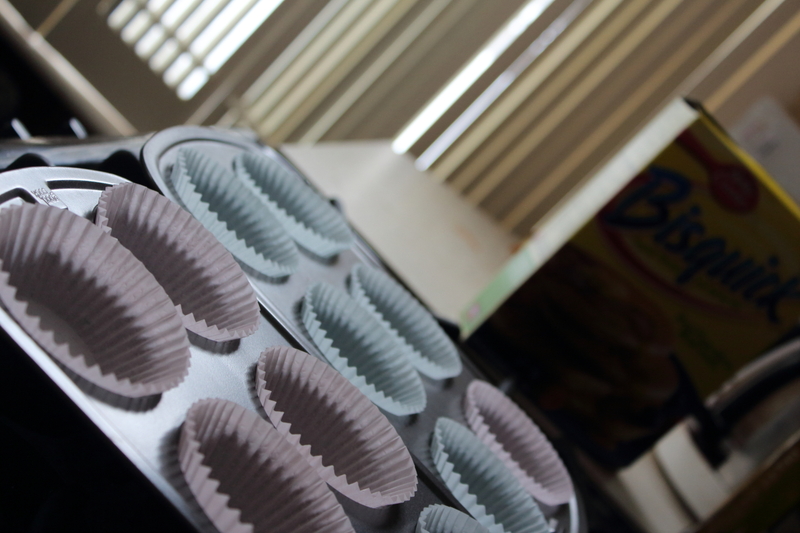 The muffins look great, never knew you could do that with bisquick. 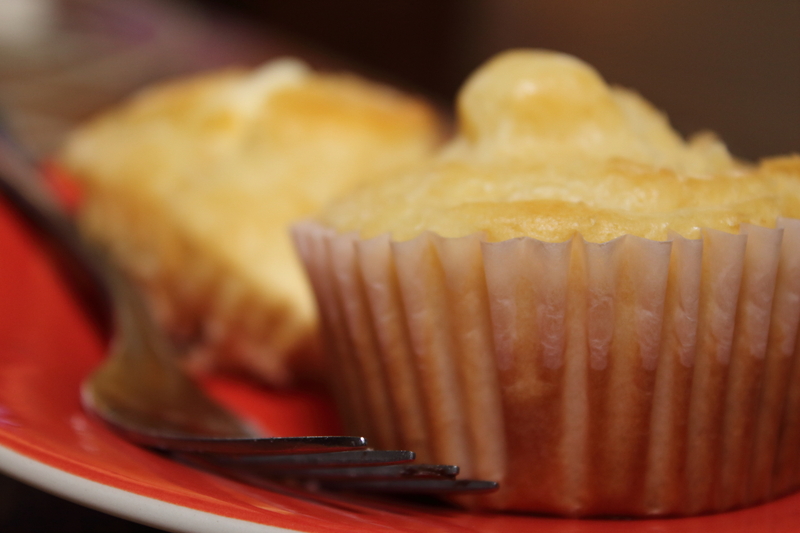 Good call and gorgeous muffins. The snow is too much for me at this point! No matter what I do to protect my back (read: everything other than regular exercise) while shoveling, it seems to take way longer to bounce back than it did a few years ago… Here’s hoping it’s another 35 years until we get another nasty blizzard like that again! It’s amazing the things you can figure out if you are trying to be lazy – I never knew you could make them either! They were really cute, maybe if we go away for the weekend and I need to make breakfast ahead of time again I’ll make some of these! I’m SO glad to BE blogging again! What a cute idea! Do you know if they freeze and reheat well? I used to freeze pancakes, and lately I’ve been freezing waffles for easy weekday breakfasts. I bet these would fit right in. Didn’t try freezing them this time. I’ve never frozen bisquick pancakes before, but I know ones from scratch freeze and reheat well, so I’d imagine these would do ok. Ill try again this weekend and keep you posted!